We are looking for someone who is interested in working in a challenging environment. The necessary support will be provided to meet those challenges. This role represents a great opportunity to expand your technical skills in a hands-on role with great scope for personal growth. Working in our Cork campus, and supported by our senior team in Dublin, we will give you the opportunity and freedom to plan and implement changes and improvements to all areas of technology in the College. We want you to grow your own skills whilst improving the services we offer. You will work with our Dublin team sharing ideas and knowledge, learning from one another with access to all areas of systems administration across desktop and hardware support, security, Linux and Windows, networking and infrastructure etc. This role offers both freedom and responsibility whilst benefiting from mentoring from senior staff as you develop. The Director of Studies will ensure that an excellent service is provided to all those who interact with the department: students and staff alike. This is a challenging and broad role and involves recruitment and management of teaching staff, student welfare and academic support and academic administration. Griffith College Cork is looking to develop a panel of lecturers to teach on the Honours Degree programme (LLBH) and the Diploma in Legal Studies and Practice. In particular, we are looking for persons with expertise in all areas of Irish law. We are interested in recruiting solicitors, barristers, academic lawyers and others who may have a professional experience of the law. We especially welcome applicants who have some experience of lecturing or tutoring at third level. Lecturing hours are on evenings during the week and sometimes at weekends. Inclusion on the panel does not guarantee any lectures. Griffith College seeks to recruit a motivated, dynamic marketing executive for their marketing admissions team. This role is an excellent opportunity for someone looking for increased responsibility and the opportunity to excel in a busy marketing department where they will gain exposure to a wide range of marketing and sales activity. Reporting to the head of marketing, the successful candidate will have individual responsibility for student numbers in specified departments, but will also contribute to the overall sales and marketing objectives of the College. They will be required to develop and implement a comprehensive marketing plan to drive awareness and applications, with activity to cover both online and offline channels. Reporting to the Senior Accountant, the Accounts Assistant will focus primarily on payroll with involvement in a wide range of tasks within the Accounts Department. We are currently seeking two energetic and highly motivated individuals to join our team as Facilities Operatives. The ideal candidate for this position would be detail-oriented, flexible and willing to take on tasks and special projects as the need arises. The Facilities Operative will be responsible for event set-up, general building fabric repairs and decoration, furniture and equipment moves, waste collection/recycling. The role would also involve the daily oversee of the Colleges on-line maintenance helpdesk and updating the weekly tasks/events board. The ideal candidate would be proactive, flexible, a good communicator and be able to work off their own initiative and work as part of a team. We are currently seeking an energetic and highly motivated individual to join our team as a Maintenance Assistant. The ideal candidate for this position is detail-oriented, flexible and willing to take on tasks and special projects as the need arises. The Maintenance Assistant will be responsible for repairs, replacing items, re-decoration, and performing other duties appropriate to the post as assigned by the Operations Supervisor (or Griffith Halls of Residence Manager). Listings are updated frequently; please check back for opportunities at this campus. The job descriptions above are not to be regarded as exclusive or exhaustive. They are intended as outlines of proposed areas of activity and will be amended in the light of the changing environment within the Faculty and the College. Griffith College is an equal opportunities employer. Candidates must be eligible to work full-time or part-time (as applicable to the job) for any employer in Ireland. We thank everyone for their applications; however, only candidates selected for interview will be contacted. 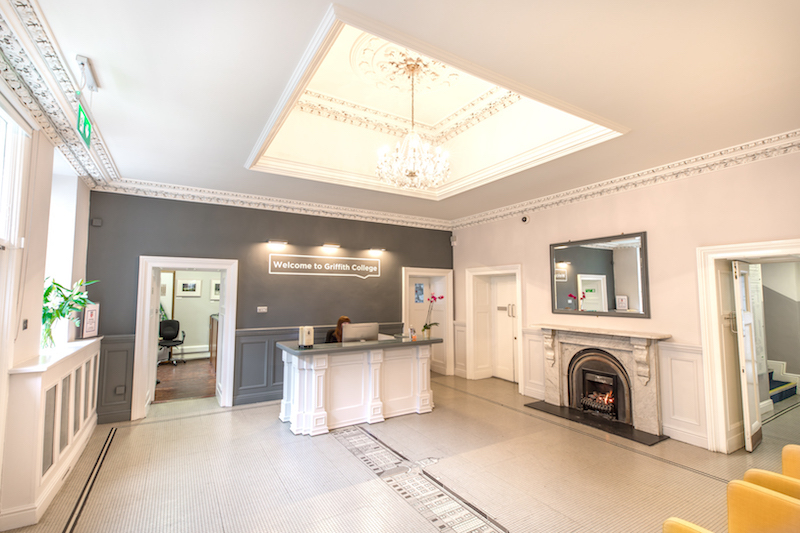 *The South Circular Road Dublin campus has free on-site parking, subsidised on-site restaurants, yoga classes, a social club, on-site laundry, gym and shower facilities. The Cork campus has free car parking facilities. Limerick and Wolfe Tone Street Dublin do not have free car parking; however, there are parking facilities available. 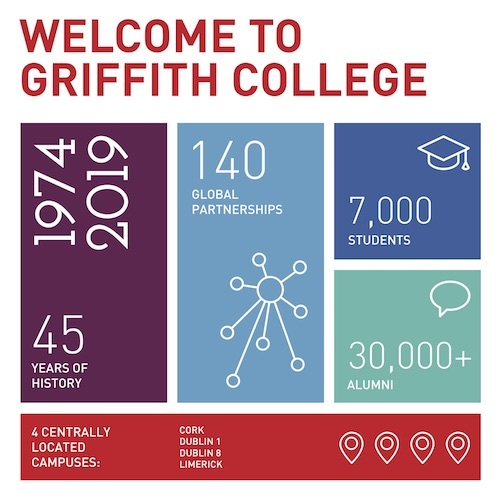 Established in 1974, Griffith College is Ireland's largest independent third level institution with thousands of students at its campuses in Dublin, Cork and Limerick. Learn more about Griffith College.